It takes a lot of people to put together a movie as big as Tomorrowland. And apparently the same can be said with tie-in books. 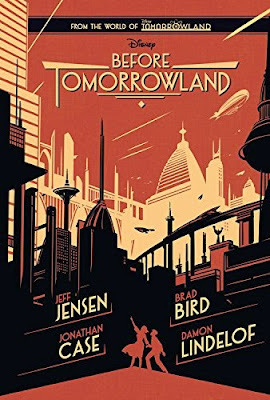 Before Tomorrowland by Jeff Jensen and Jonathan Case, with a story by Damon Lindelof, Brad Bird and Jensen and art by Jonathan Case offers the early history of Tomorrowland to the fans anxiously awaiting for the film. Will Before Tomorrowland make me more excited for the film or cool my enthusiasm. It’s July 1939 and Lee Brackett is making a hasty trip to New York City with his mother. The trip is well, not a good idea, as Clara Brackett is fighting the cancer that is physically wrecking her body. But she insists on this trip so she can visit a science fiction convention sponsored by a group called Plus Ultra. For Plus Ultra, a group of the world’s greatest thinkers including Nikola Telsa, Howard Hughes and Albert Einstein, the convention is actually a dress rehearsal of their public reveal of their greatest secret…another world! While the Bracketts are invited to play the game through a comic book that will lead them to the other world, their lives are further put at risk. A former Plus Ultra scientist, Werner Rotwang, is collaborating with the Nazis to steal Plus Ultra’s technological advancements. And in the middle is the mind of a man trapped in a robot body that has a grudge against Plus Ultra. To make things worse, the man has been abused by Rotwang. Will the Bracketts be able to survive this struggle? Can the presumed dead security head of Plus Ultra Amelia Earhart be able to protect the Bracketts and her Plus Ultra colleagues. And will anyone figure out a really cool name for the Other World? The book closes with a copy of the comic book used by Plus Ultra to invite visionaries to visit their Other World. Before Tomorrowland is a Young Adult novel that is also targeted to Disney geeks like me who are overflowing with enthusiasm for the movie! It is my excitement for the movie which lead me to do something I really do not do anymore, buy a physical fictional book. Now, my overall assessment of my investment is that the book is fine but a three or four on a five point scale not a five. The plot is fairly low key to me and is not overly complex. Being a Young Adult book it is really written to that audience not an adult market. So at times it just really did not keep me excited. Second, someone who is excited about Tomorrowland really does not need to read this to stay excited. I do not feel like I have been spoiled on much. I feel like I know more about the history of Plus Ultra, understand that robots are very important in Tomorrowland and the history of some early Tomorrowland development. And I am guessing that everything I need to know about these topics will be evident in the movie. I would say that most who consider reading Before Tomorrowland should consider a borrow not a buy. Though written for an young adult audience the book is at times very adult. There is a lot of death. The book contains graphic scenes of violence. And there are plenty of folks with questionable morals running around. So maybe it would not be the best choice for some younger readers. You should be aware that the Before Tomorrowland book on Kindle is not the same as the print copy. The Kindle version, which is free, is the comic book portion of the book. The good news is you can get this short comic to help prep yourself for the movie for free. The bad news is I wanted a Kindle version of the whole book to save shelf space and a few bucks. So I find myself somewhat confused on why a digital copy is not being offered by Disney of the full book. Before Tomorrowland really did not change my enthusiasm for Tomorrowland. I am still excited, at time of writing, to see this film which I hope will feature the ideas of progress that Walt Disney held dear. And I am pumped to see what Brad Bird will do with translating a theme park land into a fictional story. But if you are less excited than me, I would recommend reading this book but perhaps borrowing instead of buying. How does one replace a Darth Vader? Who will take Vader's place next to the Emperor if he was to falter? Kieron Gillen asks this question in Darth Vader #5 "Vader Part V."
In the Outer Rim, Darth Vader traces his potential replacement at the Emperor's side. Vader finds an oddly organic/mechanical ship (which looks like a tricked out Leviathan from The Avengers) which holds his prey. 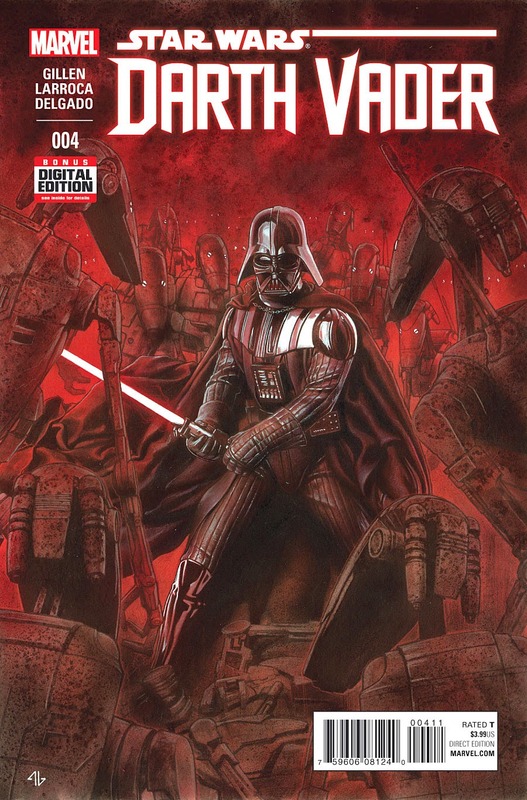 The Dark Lord takes the ship with the aid of his assassin robots, Aphra and his newly acquired droid army. But will what Vader find be rich in the force? And what plans does the Emperor have for Vader's potential replacement? 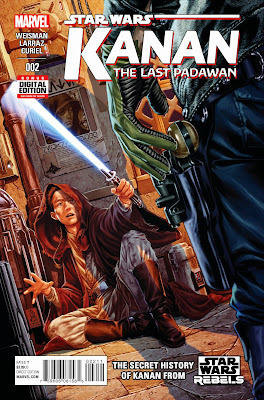 First and foremost the Adi Granov cover is gorgeous. 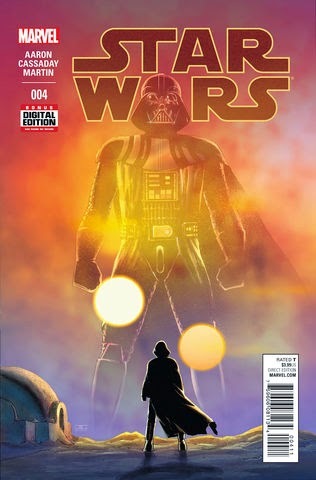 It may be the best of any of the Star Wars' covers to date. It is simple, yet detailed. And while Darth Vader may be hard to draw, Granov nails him. Not to be outdone Salvador Larroca's interior art is also well done. And I find a panel of Aphra especially striking on the first page. She communicates excitement and wonder from her eyes letting me know the following page would reveal something exciting. And this is good since the central character really cannot emote! As Vader takes the ship, the soldiers lining the halls scream Star Wars to me while also providing a different look to an old theme. Artistically I was very pleased with this issue. The story itself is largely fighting. But we get to see Vader fight a variety of opponents. I found it brisk and exciting. Honestly, I would have liked more development of Aphra, who really is a secondary character. The elephant, I mean Emperor, in the room wants to see a demonstration. Does Vader have a successor ready to take his place? And what role will the Force have in the future of the Empire. All this and more at the same Star Wars Time and Same Star Wars Channel! 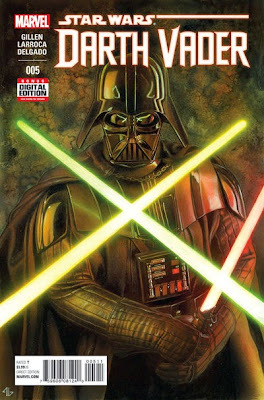 Darth Vader #4 by Kieron Gillen with art by Salvador Larroca continues the partnership of Darth Vader and Doctor Aphra. The pair travel to Geonosis to liberate one of the last remaining droid factories from the immortal queen. What the two find is a damaged queen who thinks of her droids as more than machines. Doctor Aphra takes time to discuss her future and destiny with the Sith Lord. Finally, they discover one of the Emperor's secrets from a captured smuggler. And the secret is one that Vader must act upon. I really wish I could say that the adventure on Geonosis would have been what I found as the highlight of the issue. There is a nice flashback to the movies and Anakin Skywalker's past on this planet. But really it is Doctor Aphra that catches my attention in this story, again the original character is the most interesting. It must be because she is the blank slate. She understands her role in the partnership and how Vader values her. She has no illusions where this story will take her. But she faces it with confidence! Aphra wants a life that mattered and a deal with the devil may be the clearest path to letting the universe know she was here. As the issue ends I find myself worrying for Aphra. The Emperor's secret is tied to Lord Vader. Yet I feel as if it is Aphra who is at risk. Let us be blunt friends, we cannot guarantee a spot for her in any future movies! On a quarantined world a young lady makes a desperate attempt to free a murderous robotic mind from imprisonment. Her desperate attempt leads her into a partnership with Darth Vader, who finds himself without resources while he lacks the Emperor's favor. 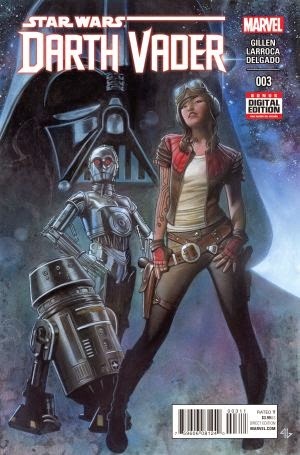 Vader partners with the adventurer, rouge archaeologist Doctor Aphra, to increase his personal power through machines, starting with two assasin droids. Aphra offers Vader even more robot power on a world that has a deep personal connection to Anakin Skywalker. I really liked this Kieron Gillen story with Salvador Larroca art. Though I will admit I do feel like I have seen some of this before. There are portions of this tale that remind me of Brian Wood's Dark Horse arc "Five Days of Sith which also saw a disgraced Vader paired with a female counterpart. And there is part of Aphra that feels like Indiana Jones...okay a big part including a reframing of a classic line! So there will be moments where you might say, yeah I have seen this. But the story still is very successful. A big part of the success of Darth Vader #3 is setting up Aphra as a character. She is clearly intelligent, adventurous and follows very questionable morals. She has quite the dark side to her, but it is different than Vader's evil as she is talkative and what I would call adventurous bad. I find myself liking this black hat and her love of evil robots is something that has my interest. So I look forward to seeing what Gillen does next with this new non-Sith bad guy! Darth Vader #3 hit all the right beats for me. And I enjoyed yet again the introduction of an entirely new character. Though if we have learned nothing in our Star Wars lore, standing too close to Darth Vader can get you burned! 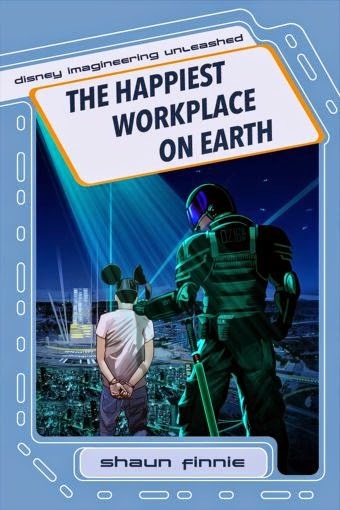 The Happiest Workplace on Earth by Shaun Finnie establishes a parrell world where Walt Disney began work in his city of tomorrow, Epcot, in 1974, and passed away two years later. Decades later in our future, Jack and Ellie Rothman find their dream come true as they are invited to become citizens of Epcot. Of course their teenage son Heath rebels against the idea of leaving all of his friends! Ellie Rothman has dreamed of living in Epcot her entire life and Jack wants to do nothing more than support his wife's dream. And Jack's expertise with genetically altered plants is the family's avenue into the Experimental Prototype City of Tomorrow, he specializes in designing vegetables filled with anti-depressants. But Epcot seems less magical than the Rothmans believed as the rules of the community appear oppressive with everyone fearing the Epcot Security Patrol and losing points against their citzenship. 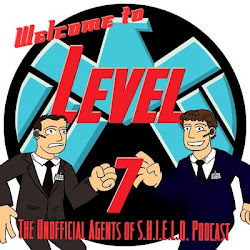 The Rothmans find themselves caught up in a conspiracy that frames Jack Rothman, and his outrageous beret, as a terrorist bent on destroying Walt's futuristic city. As I started this fictional work I thought, wow this is a nice little what if story about the Epcot that could have been if Walt Disney had lived longer and completed his vision for the Florida Project. It feels like a nice idyllic city where families and scientists help extend the world's knowledge. Epcot is a working city where families live and industry flourishes, under the authority of the Walt Disney Company of course. However, the future is not as bright as one might think. The cover really should have given it away to me. Epcot is actually a darker place than we might imagine. And the Rothman's are not as safe as we might hope. One's stomach begins to get queasy as we begin to imagine how close Epcot, a planned and controlled society, could be to a tyranny. Though it is fictional, it does make you wonder about what a completed Epcot could have been, especially when being lead by someone who was not Walt Disney. Epcot allowed for a large amount of control by the Walt Disney Company and if placed in the hands of the wrong people it could be used to harm others. And it becomes easy to see how some would rebel against that authority. One cannot but help but cheer for the Rothmans. I identify most to Jack Rothman, a family man who works hard and as a flair for individuality. Jack wants to make his move to Epcot work for the sake of his family. And he becomes the center of the plot that puts himself and his entire family at risk. I really liked the choice to focus on Jack instead of Heath, who I thought was going to be the action hero. Jack in many ways is the least likely hero. Therefore, when Jack is at risk you feel the tension. Ellie is a loving wife with a dream, one that Jack wants to fulfill. And his love makes me want to cheer for him more. Sadly for Ellie this conspiracy will destroy her fantasy of what Epcot is. And you feel your heartbreaking for her. Heath is the typical rebellious young adult. But you can feel like he might be a good kid raised by parents like Jack and Ellie. And while he is not the center of the story, Heath's character will be tested by the situation. I find myself focused on the family because it is their interactions in a world gone wrong that kept me returning to the book over and over again. With Tomorrowland being released soon in theaters, it is a great time to imagine a world that might be. The Happiest Workplace on Earth provides us a story of a world like ours where Epcot as designed by Walt Disney came to be. But as the Rothmans show us, maybe that world is far from magical! And its an Epcot well worth your time to be entertained by and contemplate. And I am really looking forward to diving into the next book in the "Disney Imagineering Unleashed" series. Now eat your magic lettuce and be happy! 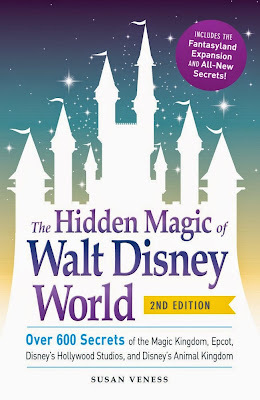 It has been nearly 400 posts since I reviewed The Hidden Magic of Walt Disney World by Susan Veness. New Fantasyland has come to life. Test Track is now more Tron than General Motors. And Avatar has led to shifts at Disney's Animal Kingdom. I think it is fair to say that now is a good time for an updated version of Veness' title. The Hidden Magic of Walt Disney World: Over 600 Secrets of the Magic Kingdom, Epcot, Disney's Hollywood Studios and Disney's Animal Kingdom by Susan Veness provides a behind the scenes tour of the Walt Disney World Resort. Veness walks her readers methodically through the four theme parks, land by land, providing background and hidden secrets to the attractions and sights. Veness' facts help the guest better understand the work that Imagineers have put into the park, and allows them to seem super knowledgeable to their friends and family as they enjoy their Disney day. Along with her own descriptive text, Veness breaks away from the tour to give her readers "Fascinating Facts" about the parks and "Imagine That!" interludes where Disney's Imagineers and other creatives discuss attractions in their own words. Each chapter ends with a detailed and descriptive, though balanced and brief, timeline of each park. I think the first big question really is how does this stack up to the first edition? So let us just rip off the band-aid and be honest about the first edition! At this point if you are buying the original as new to you, you are buying a time capsule, a historical tour of the past. Because the Walt Disney World Resort of 2009 is long gone at this point! So really, if you want a behind the scenes tour book for today...you need this volume. The old volume simply captures attractions that are now extinct. And I found myself surprised how many new attractions there really were as I read through the book. Even areas I have thought of as static, like Main Street U.S.A. have significantly changed, with meet and greats now offered on the Magic Kingdom's main drag. In short, a new edition was truly needed and at times it made it feel like a whole new book to me due to the number of changes at the resort. Now, just because this is a second edition does not mean that all the old stuff has not been updated. On page 110 of the original volume is a discussion of the bridge between the France and United Kingdom pavilions at Epcot. The same paragraph can be found on page 138 in the new edition. In the old edition this paragraph is followed by an "Imagine That!" which is now absent in the updated volume. But instead in the new version there is a description of a cameraman not being edited out of the Impressions de France film. The France segment is actually halved in the Second Edition. But except for the bridge paragraph the content is new. The Tower of Terror seems to me to be an attraction that should not have changed much since 2009. However, while the description includes around the same number of pages, there is new Hidden Magic for the reader to look for. So despite being an updated edition there is still new Hidden Magic for the reader of the old edition. And I will admit, though I have not read the original in depth for several years (I have used it as a resource several times though) the Second Edition felt fresh to me. The two editions are roughly the same size, and I can see edits for space where I assume Veness had to shrink content down to allow for new Hidden Magic and new attractions elsewhere. Other points I have made in the past stand. The book is well-written and easy to access. Veness uses bold text to help the reader scan through content, which is especially helpful when walking through the park and wanting facts on hand. The book itself is small enough to fit into a backpack. And I found this edition as enjoyable as the first. I think if I was to make any suggestions, I would like to see a chapter on Downtown Disney. But since that is very much in flux in 2015, I can understand why it continues to be excluded. The time has come for an update! The Hidden Magic of Walt Disney World: Over 600 Secrets of the Magic Kingdom, Epcot, Disney's Hollywood Studios and Disney's Animal Kingdom by Susan Veness captures the Walt Disney Resort of today, sharing the Hidden Magic in the stories behind beloved Disney attractions. Some may argue that it steals the Magic. But for me, Susan Veness has only made the resort more magical by giving background in an easy to digest format. Princess Leia and Evaan continue their search for the scattered remnants of Alderaan. In Princess Leia #3 her quest takes her to Sullust where a enclave of survivors have preserved themselves in an cloister. But the leader of the survivors questions Leia's motives and her right to rule. And the survivors may have a dark past. The action comes to a head as the Empire finds Leia because of a mole in Leia's entourage. Can Leia save her people and win their loyalty to her cause? I have been pretty down on Mark Waid's story in the past, mostly wondering if it was exciting enough. 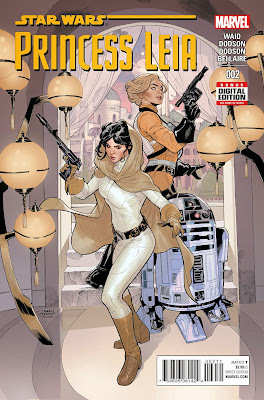 This issue to me was the best and likely is in my top five of the new Star Wars books. The story is full of action and it moves at a nice brisk pace. And R2-D2 gets a nice moment to shine on the page as he demonstrates his resourcefulness. In short, R2-D2 finally gets something enjoyable to do (or as I would say at Welcome to Level Seven he got off the Bus). And we get to linger on the conflict that the survivors have about Leia. Is she somehow part of the Empire, she was a member of the Imperial Senate. And bad things seem to follow her wherever she goes! Yes, is Princess Leia really our leader? We also get to contrast this with Evaan who has unquestionable loyalty to the crown, despite the fact she is not really a fan of the Princess. So action and character combined with fitting art from Terry Dodson and Rachel Dodson really created a strong issue to me. 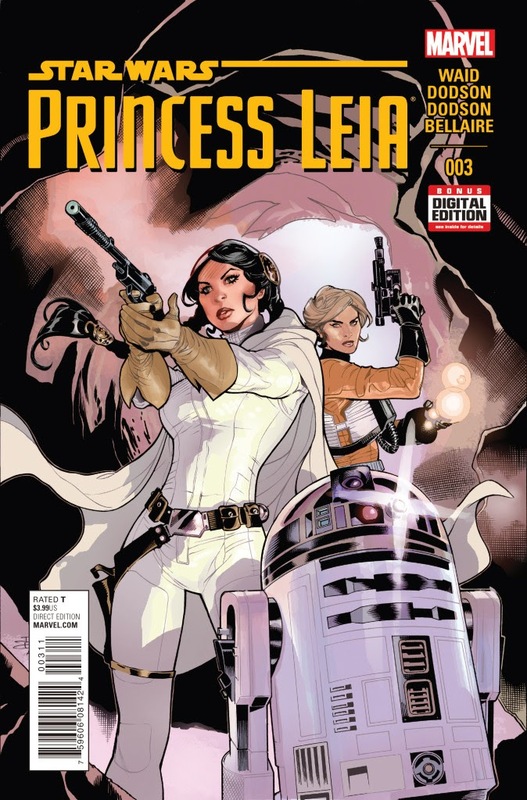 As Princess Leia #3 ends she knows that the Empire has her in their sites. And one cannot help but feel tense as we know who the traitor is. Can Leia uncover the mole and save her people...next month? 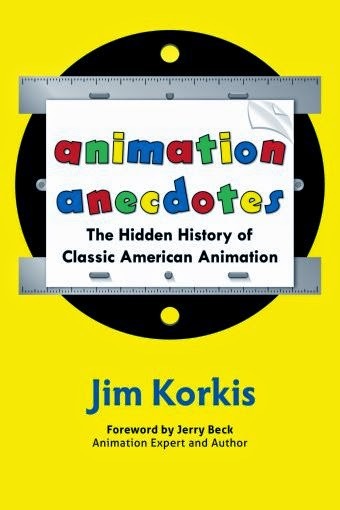 Animation Anecdotes: The Hidden History of Classic American Animation by Jim Korkis provides snippets of animation history from Disney and other animation studios. The book is broken into 14 chapters organized around studios including Disney, Hanna-Barbara, Bluth and more. Additionally there are chapters on television productions, non-Disney features, miscellaneous and projects that were never made. The chapters consist of stories from animation history that are generally never more than a few paragraphs in length. The stories include lost history, humorous anecdotes, and interesting facets from animation's past. As a Disney fan the Disney chapter caught my immediate attention, and luckily it was first. My favorite story from this chapter focuses on Ward Kimball trying to avoid Ray Disney, Walt Disney's older brother. And being a history fan I enjoyed reading of Adolph Hitler's complicated relationship with Mickey Mouse. Additional chapters that I enjoyed because they brought back memories of my childhood include Hannah-Barbara and television cartoons. These chapters allowed me to reflect on Marvel cartoons from my childhood and before along with other Saturday morning cartoons of my past. I found myself almost shocked to read about how simplistic the animation of some of the earliest Marvel animated programs was. I do have to admit that despite Batman being part of the other stable, I still really enjoyed these and pretty much all other superhero tales. Again, the chapters are small. And the tales are connected by theme and not telling a larger story. So it is easy to pick the book up and down for commutes or short snippets of reading. Korkis' writing is clear and easy to follow. The book also has an index which allows the reader/researcher to jump to the topic or animator they want to read about. For the Disney fan, Animation Anecdotes helps open one's mind to the larger developments in animation beyond the Disney studio. One of the trends that a watchful Disney fan will notice is the movement of animators between Disney and other studios including Friz Frelang and Rudy Ising. This is all done in an accessible format that can be enjoyed by both amateur and serious animation historians in an enjoyable manner. My buddy Ben has a phrase, Darth Vader is hard to draw! And I have noticed from the original Marvel comics run that sometimes even legends cannot handle Chewbacca. As I read Star Wars #4, I sadly found these thoughts returning to my mind. In part IV of "Skywalker Strikes" the Rebels and the Empire deal with the repercussions of the destruction of the Empire's largest weapons factory. Darth Vader is forced to "negotiate" with Jabba the Hutt on Tatooine. And the deal making is full of tension as the Empire looks to take the supplies it needs. Meanwhile Princess Leia pushes the Rebel Alliance to keep pressuring the Empire and asks for a small team to make offensive strikes. But Luke Skywalker who is reflecting on his lack of Jedi knowledge questions if he should continue the fight. Finally, Darth Vader attempts to learn more about Obi-Wan Kenobi's time on Tatooine and sends out Bounty Hunters to discover more for him. I did enjoy this Jason Aaron continuing story, though this issue is more bridge than action. The tension between the Hutt and the Sith is something every fanboy (and fangirl) can enjoy. But I do find myself distressed at times with John Cassaday's art. Yes, there are some brilliant splash pages including the final frame. But there seems to be a lack of life at times in some of the art. And at other times I find the eyes disturbing, with both humans like Leia and aliens like Jabba the Hutt. The art somewhat took away from my enjoyment which combined with a lack of action really made this my least favorite of the four first issues. I had not noticed before but instead of * to mark editors notes Marvel is using a stylized "SW" to catch our attention. 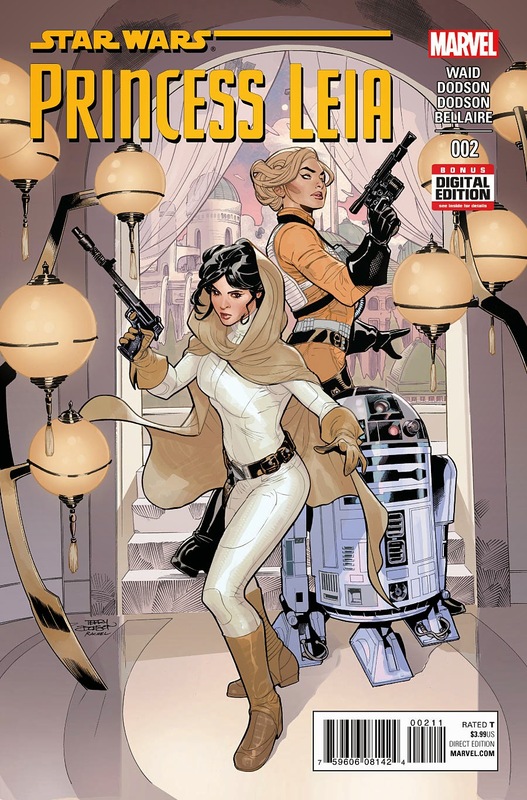 I hope this carries into other books and continues to push forward the Star Wars branding. Star Wars #4 was a little disappointing for me. But it promises to kick off some strong action in the next issue. So I continue look forward to next month with a smile. Because with a comic debut like the one found on the last page...well you know something interesting is sure to happen.